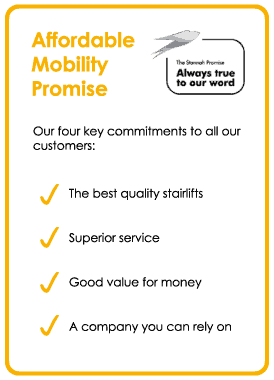 At Affordable Mobility we understand the importance of peace of mind and in the unlikely event you need assistance or help with your stairlift our teams of locally-based service engineers are on standby 24 hours a day, every day of the year. Priority access to our breakdown service, 24 hours a day, every day of the year. Most replacement parts needed due to normal wear and tear. Call outs due to product break downs (please note call outs due to misuse, accidental damage or other circumstances beyond our control will be charged – see T&Cs for more information). What if I don’t have a service contract? Our service contracts are the most cost effective way to ensure the maintenance of your stairlift but we can still help even if you aren’t a registered service user. Give us a call to discuss your requirements and we’ll be happy to give you a quote. What if I no longer need my stairlift? At Stannah, our end to end service means that when you no longer require the use of your stairlift, we can remove and dispose of it in accordance with national environmental standards in our removal scheme. Call our customer services team on 01264 384763 to find out more. What if I am moving house or redecorating – can I take my stairlift with me or take it out while I am having work done? Depending on what kind of house you are moving to you may be able to take your stairlift with you. If you have a straight stairlift and your new house also has a straight stairs, providing your rail is long enough it should be relatively simple to do. For a curved stairlift we would have to remake a rail but it would be more cost effective than buying a new stairlift altogether. We also offer a service where we can remove your stairlift temporarily to allow for new carpet to be laid or extensive redecoration work to be done. Our customer service team on 0120 044 4254 will be happy to advise you. If your stairlift or homelift warranty is due to end, your local service branch will be in touch with details of our service plans. We offer two service plans to keep your mind at ease and your stairlift or homelift working to its full potential. Call outs during office hours to product break downs (please note call outs due to misuse, accidental damage or other circumstances beyond our control will be charged – see T&Cs for more information). Reduced rates for any work not otherwise covered. Please see our service contract terms and condition for full details. Our local service branch will be happy to answer any other queries you may have. If you should need to contact us to arrange for an engineer to visit and service or repair your stairlift or homelift, please contact your local service branch for the fastest possible response – you can find their number below. Remember, we can repair and service all makes of stairlifts and homelifts, not just our own Stannah models. A service / inspection visit may be required prior to being accepted, to determine the make, model and age, please call to discuss. Get Your FREE, NO OBLIGATION quote online NOW!